Home What's it like to be a homebrewer in Georgia? What’s it like to be a homebrewer in Georgia? I have a lot of equipment in my basement. It’s a fairly crude setup. A lot of guys have these flashy rigs, all these pumps and electrical equipment. I set a burner—a Bayou Classic, like a turkey fryer—on cinderblocks and drop a 15-gallon kettle in there. It’s expanded my social circle in ways I had never imagined. Not so much in my neighborhood, per se; a lot of great events for homebrewing happen in Atlanta, so I have to travel. But some of my best friends have come through the beverage industry, through homebrewing and clubs. My friends call me all the time. With the beer scene there’s never an off-season. The big thing about brewing is being able to manage, control, and repeat your process. That’s the key to consistently making great beer. It’s the perfect marriage of art and science. I consider brewers to be artists. Their medium is grain, water, hops, and yeast. Sometimes it is kind of funny being the only African American in the whole room of 30 people homebrewing, but it’s not uncomfortable or weird. We’re all here for the same reason: We love beer, making it, talking about it, judging it. There’s a rise of females entering the industry, too, which I think is awesome. Girls got game. I don’t think the saturation of breweries has done anything to diminish people’s interest in the hobby. 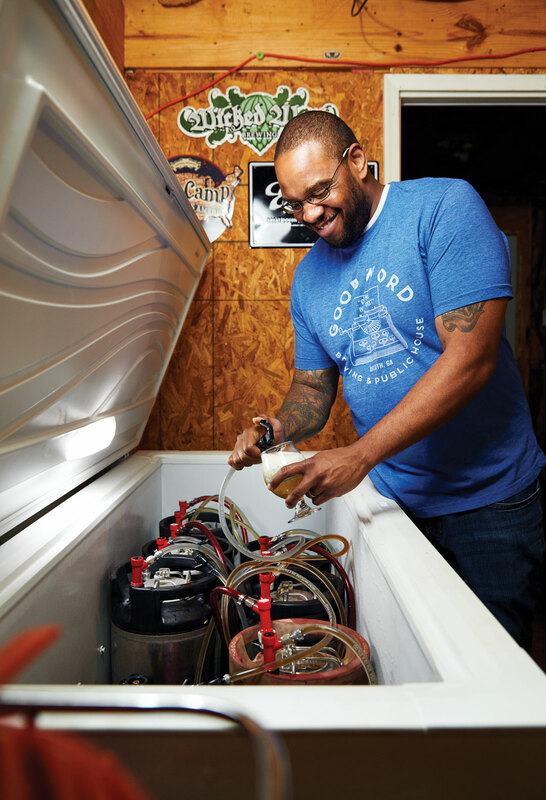 Homebrew is some of the freshest beer you’re going to get.